Posted May 4, 2015 by Freda Casagrande & filed under 2015 Trip in April. Now I am in the aftermath of this terrible experience. I will never forget this day just like so many in Nepal, every time they hear a rubble they ask is it happening again. The feeling of the earth moving underneath you is so utterly disconcerting. It takes away completely all control of your life while you hang on and see what devastation it is going to cause. How can nature take so many lives, lives that had not been lived, lives that were innocent. I think back to when it happened, the terror in my heart. 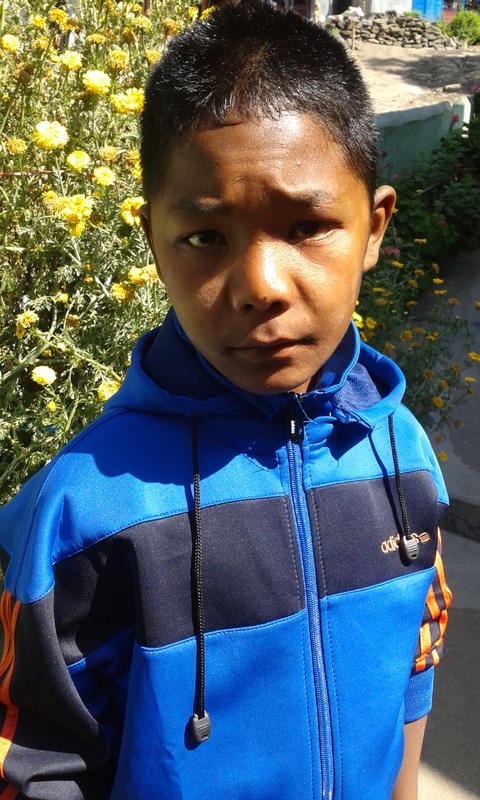 Suman one of our supported children had come back with us that day to go for a hospital check up. The journey from Lamjung was always a long one fraught with big lorries sounding their horns. Suman suffers badly from travel sickness, we stopped several times for him to be sick. We stopped at the normal half way stop to have lunch. A nice stop very beautiful, surrounded with huge mountains, as was all of the highway. After lunch Binod took Suman to look at the river, I stayed behind paid the bill and went back to my book. I heard a huge bang, my head told me it must be another thunderstorm, (we had had a few recently). I looked up and saw that the building higher up was rocking, then heard screaming as people struggled to get down the steps. I was at the lower level as people held onto walls to get past me, they holding onto the walls as they could not stand up. I very slowly got up and held onto everything I could to get to the steps, rather than jump or run. I got down to the grass, I could not stand, I suddenly thought about plane crashes and what you would do, (this may be completely irrelevant for safety) But that is what I thought of at the time. I saw that there was a clear area of grass, I could not get down to Binod and Suman so I decided I had to make sure I myself was safe. I laid on the grass face down with my palms face up over my eyes. I felt the ground moving underneath me rocking, it felt so big the movement, it really felt like the whole of the planet earth was moving. Such a big thing to be moving, I heard screaming, but told myself that I must be calm. I laid there saying to myself it will be over soon, be calm it will go away I took deep breaths. My whole being felt an inner fear, but I would not let it take me over. It stopped! People just stood around saying nothing, nothing at all. Binod came up to me with Suman we turned to see rocks falling from the mountain as big as houses. I walked back to where I had been when it started, where my things were, the waitress who had served us was crying, I hugged her she was worried about her child, she was trying to get through on the phone.